oh so gorgeous Rema! I totally loving the 2nd one!! Oh my gosh, Rema! These are so beautiful!!! I’m so impressed!! Love the colours and design of both cards. Great card. I love release day ! Both of your cards are wonderful! Gorgeous backgrounds!!! Wonderful and beautiful as always. Thanks for the great inspiration!! Gorgeous cards! Love both of them, but really love the curtains. Love both cards, but the bird card is my favorite. Absolutely gorgeous. Absolutely lovely cards! The colors are wonderful. What super cards. I love the sentiment on the first one and how it fits in the windowpane. These cards are lovely. The blended backgrounds are really pretty. Great distressing, pretty curtain. Two lovely cards. Love your designs! They show the great versatility of this set - thank you! Think I love the simple stamping of the window the best! The background on the second card is to die for!!!! The Framescapes card is so sweet and the Zig marker card is stunning. Your cards make me so excited to see this set! Beautiful card! Remind me of my home back in Europe. Thank you! lovely card and those sentiments are just the sweetest! Love how you added it to one of the window frames. Wow! Gorgeous cards! Love them both. Two beautiful cards. I can't wait to see the complete set. I can see that this set will be very versatile for both masculine and feminine cards. I love both of your cards! Great inspiration! I love your work and this set. Sweet cards, Rema! Your Distress Oxide sky is gorgeous. So cute, and I love the sentiments. I like how you can either do a quick card or a more in-depth card using this Stamp set! Soo excited! Such a great idea just to use one curtain. So simple, yet so effective! I love the sentiment. The background on the 2nd card is amazing. Thank you for sharing your talent! Beautiful cards. I especially like the second one. Love the silhouette images. Like a view through a frosty window! Your cards are beautiful and your sentiments are so moving. Very pretty cards! Love the distress coloring. These are both really nice cards! 2 Lovely cards...The friendship saying is super and it just fits in the window opening...like the single curtain!! Love the one sided curtain. Both of your cards. Great ideas. New idea of using curtain on one side. Looks nice. Single curtain idea is also very nice. Thank you for sharing. Pretty cards and I especially like the one featuring the birds. Nicely done. Beautiful cards. The colors are so pretty. Love both of these scenes. Love your cards! Hard to say which I like better, love both of them! Great cards! I love the colors ans design. I love both of these cards. Wish I could do backgrounds like you! I love the card that didn't even use the "frame"! Gorgeous! Beautiful cards. Love the window idea with a sentiment. Love your card and you are so talented and love the scene you created, fabulous! Oh my gosh, Rema! I love you window card with pink and spring flower. This card is a winner in my book0!! 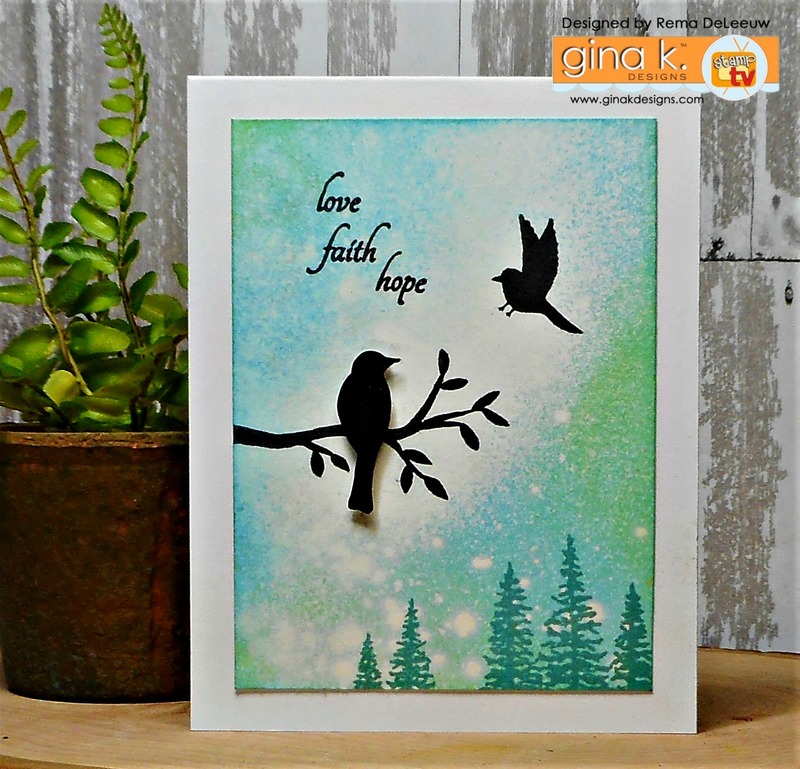 Two very gorgeous cards you made with the new window frames set. I am very inspired. Great backgrounds on both cards. My favorite is the 2nd card with the birds. Thanks so much for sharing. Love your cards! Very creative. I always love your sponged/watercolor backgrounds. I wish I could watch you make them sometime so that I can learn how to do it better! I love your take on using the window on a card. Such a sweet card. Beautiful birds and cards! Love them! I love your backgrounds! They make your cards so rich looking. Fun stamp set. wow...love both of your cards...this stamp set is going to be so versatile! Beautiful cards, love the backgrounds. Amazing: yet another entirely different, yet lovely card! Placing just one curtain is a great idea. More room to place stamp etc. in the windows. Great stamp set. Appreciate that you gave an idea to use the set without the window. The cards are awesome! I love the single curtain idea! Thanks! what a beautiful card--the hearts on the curtains are adorable. Rema, Your cards are both beautiful. I love absolutely everything about the love, faith, hope card. So pretty, and I have to learn how to use the distress oxides. So pretty! WOnderful cards,Rema. The more I see of the sentiments, the better I like this set. These are both lovely. I really like the beautiful background on the 2nd one. Love the spring flowers in the window. Very special card! Such a sweet card! I love the sentiments too! Beautiful cards. I love the curtain panel! I like the heart curtain on just one side and the beautiful design of the bird card. Rema, these cards are so lovely. The colors you used are so bright and beautiful. I enjoy your work so much. Thank you for sharing. Love both cards! Especially the curtain on one side! I love seeing what your work!! Lovely cards! Your backgrounds are beautiful! Such a sweet sentiment on your first card. I enjoyed both cards. Love the colors you used. Love the color choices on both of your cards. Lovely job. Wow, this one is really different from the rest. Great job. LOVE YOUR CARDS! Very creative and unique. This will be a FUN and versatile set. Fantastic cards! The first is very sweet with the one curtain, lets your mind imagine the rest of the scene. The second is gorgeous. I love the touch of white behind the birds it really highlights the birds. These are super sweet designs ! Two beautiful cards! I really like your backgrounds. You did a really nice job on the curtain with hearts. The coloring on both cards is subtle and sweet. I like your silhouettes that make your distress oxide beam through. Lovely cards! Great designs and use of the stamps. Great cards!! I love them both! I like your take on the window scene...no cutting and still beautiful. I love the soft look on your pretty bird card. Great job. They are beautiful. I can feel the warmth of the sun coming through the window. Beautiful cards, Rema! Love the CAS designs...really makes the images stand out! Wonderful creations and looks like an awesome release too. Wow. Beautiful cards, I especially love the birds card! wonderful cards. so much meaning is conveyed.